And by that I mean it makes me cry, use way too many tissues and become very red. All in all, a very glamourous experience. To survive, I developed a few broken techniques. For example, I avoid the red at all cost. Is it tomatoes? Chili? I can never be too cautious. But here in Thailand, green is also dangerous! Look at this delicious green curry! A bite can't hurt, right? Wrong. I did my research and can now give you (in no specific order)... My top 5 non spicy options for sensitive palates. 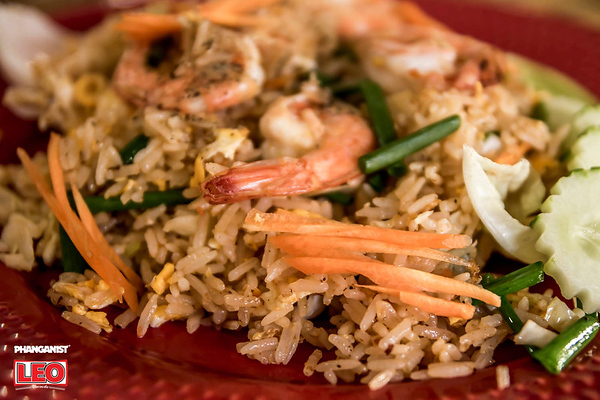 This dish is made with fried rice, some veggies (for a healthy touch) and your choice between chicken, pork and shrimp. It comes with lime, but also chili juice (on a separate plate). Feeling adventurous, I actually put a tiny bit of it on my rice and it was delicious. It just added a kick, without burning. 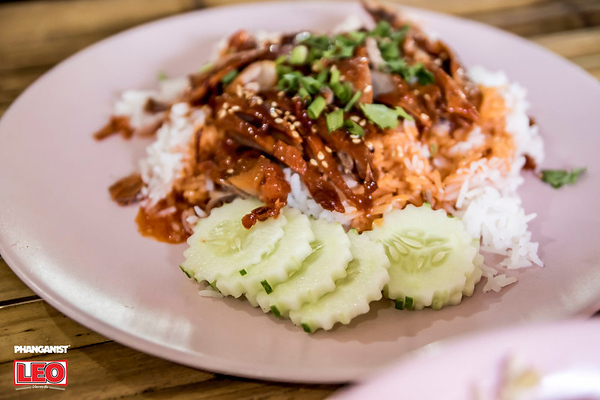 Khao Moo Daeng, grilled pork and rice. I was a bit worried when I saw this one arriving in front of me, I'm not gonna lie. The rice was covered in red sauce. Red! But I was hungry, so I tried. To my surprise, it wasn't spicy! The sauce was a bit sweet and mixed very well with the grilled pork. It looks like it's usually served with a boiled egg, but I wasn't that lucky when I ordered mine. I did get a tasty soup though, so I'm not complaining. My all time favourite. I got surprised once or twice with a hint of chili, but it's usually a safe bet. And delicious with that. 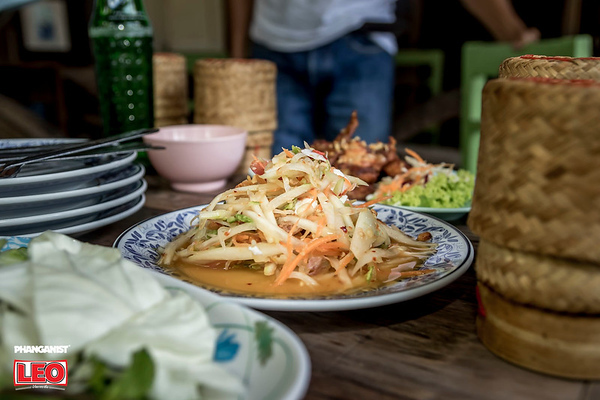 Long rice noodles, green onions, eggs, peanuts, some veggies, lime and your choice between pork, chicken and shrimp. You can't come to Thailand and not try pad thai. Pad Pak Ruam Mit, stir fried vegetables. The best way to eat your veggies. The recipe usually includes broccolis, carrots, baby corn, mushrooms and mangetout, cooked in soy and fish sauce. You can find this dish in almost every buffet style restaurant. It's a safe and tasty choice when you're facing a dozen unknown options. It goes very well with some Khao Pad. They usually make the non-spicy version in the same pot as the spicy one, so you will get some chili. I would also advise you to be careful where you order because you might get a small crushed crab in the middle. It happened to me the first time, and that wasn't my cup of tea. But despite the light spiciness of it, I would recommend the papaya salad. It is, like pad thai, inescapable. One last tip before I let you explore safely Thai cuisine. If you end up gasping for air with a burning throat and if your friends are looking at you like you're turning into a non-human creature... Don't rush to the water. It would just spread the burn. Your best option is milk. In some restaurants you can get a chai yen, a traditional Thai iced milk tea. But in general, any dairy product will help. There are other, weirder, options, like taking a teaspoon of sugar. If you have one with you and you don't like milk, you can consider it. There are, of course, other non-spicy options. Food is about enjoying ourselves, so let's keep exploring and taking risks!